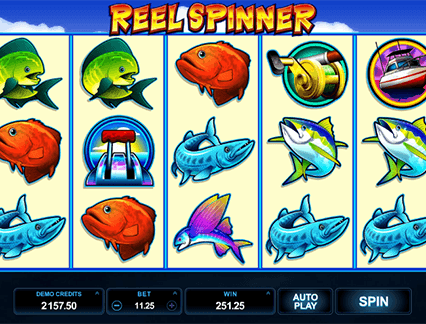 Reel Spinner - Play Now And Get The Best Slot Experience! 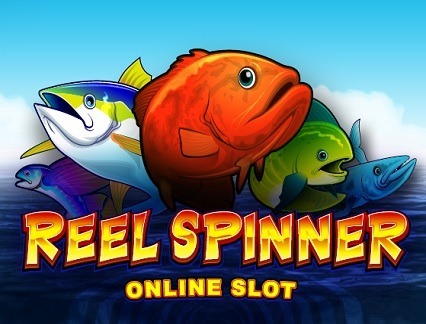 Game Information: Fans of deep sea fishing will enjoy Reel Spinner, a five reel, 15 payline online pokie powered by software experts Microgaming. This pokie is inspired by the deep blue ocean and gives you the opportunity to cast your reel on plenty of wins. Choose to stay on dry land, take cover from the sun, but whatever you do, play Reel Spinner and you could ‘catch’ some spectacular rewards. The game gives players the choice to play for free or for real money from all devices, including desktop, tablet and smartphones. Reel Spinner is a five reel, thee row, 15 payline online pokie featuring an oceanic theme that is represented in the visuals and sound effects. Most of the symbols are different types of fish, which spin against an ocean background. These fishy-related symbols include a fishing boat, a compass, a throttle, a reel, and five fish of various shapes and colours. Start your adventure by clicking on ‘Bet’ to adjust your choice size, which ranges from 0.01 to 0.05. Click on ‘Max Bet’ for the maximum bet and ‘Coins’ to set the number of coins per line. Once you are ready, press ‘Spin’ to set the reels in motion. The wild is the game logo and replaces all other symbols on the reels but not the scatter, which is the swordfish icon. The wild can also form its own winning combinations without having to replace other symbols. Scatter symbol wins are multiplied by the total bet staked, and landing three of these symbols will trigger the free spins feature. Reel Spinner is a standard game that features bright and bold graphics that will appeal to many players. While it is not the most innovative of games around, it does offer a pleasant gaming experience and seems well designed in terms of visuals and sound effects. If you like your gaming fuss-free yet rewarding, then this is a great choice. The game features a 5×3 layout and 15 fixed paylines, which is standard. Players can therefore only adjust the bet range, which ranges from 0.15 to 11.25, making this game great for low rollers while there is not a whole lot of rewards for high rollers. The free spins round is the game’s strongest feature with a maximum of 20 spins up for grabs and a multiplier up to 5x. Additionally, the game has an RTP of 96.38%. The only extra feature in this game is the free spins, which can prove to be quite lucrative. This feature is triggered when you land three or more swordfish scatter symbols anywhere on the reels. On your screen, six boats will appear and you must choose one to determine the number of free spins you will earn. A reel will then appear which must be clicked to reveal a multiplier. During the free spins round all wild symbols will be stacked to help achieve extra wins. Free spins cannot be retriggered and once it is over you will return to the base game.